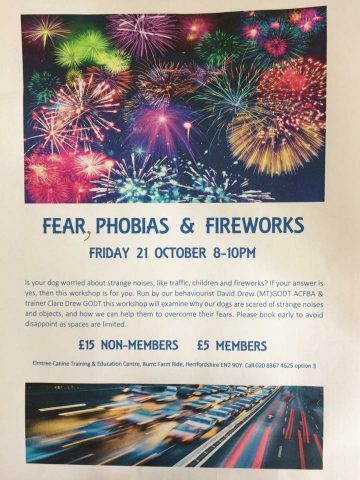 Fear, Phobias & Fireworks, come along to our discussion on your dogs anxieties, this time of year can be particularly stressful for many dogs, fireworks, the hustle of the build up to Christmas, increased traffic, dark nights etc. Lots of dogs develop phobias, how we deal with them is vital to how far they escalate. There are lots of ways to help calm our dogs in stressful situations, anyone who has done David’s Harmony or Sensitivity classes at Elmtree Training Centre will be aware of recognising your dogs tolerances to stimulus and the importance of keeping your dog under threshold when possible. The evening is an interactive discussion where we can share ideas and solutions to problems relating to fears and fireworks. Ideal for prevention if your dog doesn’t have an issue with fireworks and solutions if your dog does have problem during this period. If you take away one idea that works for your dog it will be an evening well spent!